The windshield was frozen and the blocks in the back of the truck were in day three of their freeze-thaw testing cycle. We grabbed our complimentary breakfast of quiche drizzled with green chile sauce, used about a cup of gasoline to defrost the cab, then headed east for Texas. Four hundred miles on US 84 through Clovis New Mexico to Snyder Texas. Four hundred miles almost dead straight and dead flat. They grow cotton now, but Snyder was named for merchant and buffalo hunter William Henry (Pete) Snyder, who built a trading post on Deep Creek in 1878, and sold so many buffalo hides Snyder was known as Hide City. Oil was discovered in Snyder in 1948, leading to a decade of boom town when, as our innkeeper Marianne told us, “everybody went out and bought new Cadillacs”. That boom died, and so did the town, almost, but held on by growing cotton and watching pump jacks squirt drops of money into their savings accounts. 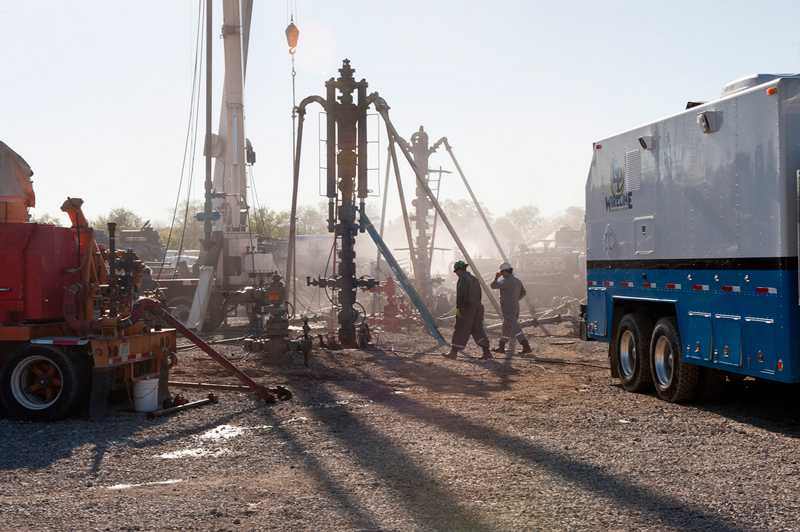 Then, a few years ago, oil geologists discovered new money: “The formation being referred to as the Cline Shale in West Texas is one of the hottest new shale plays in North America.” Fracking had come to Snyder. The problem with fracking is it takes all the water. If a farmer doesn’t get a mineral rights lease with the oil company, he can always sell them water from the aquifer. The Cadillac salesman moved back to town. We spent the night eight miles out of town on a dirt road at Windmill Inn, rustic cabins on a thousand acre ranch, run by a seventy-five year old Marianne who inherited the property from her father, complete with it’s monthly oil revenues. Marianne’s kids inherit the mineral rights from her and the monthly checks into the bank, “except Bill, he gets the surface”.